North America-based precision engineering company MSB Design is introducing a first of a kind, up-lit crystal glass rack holder to light up aircraft galleys. 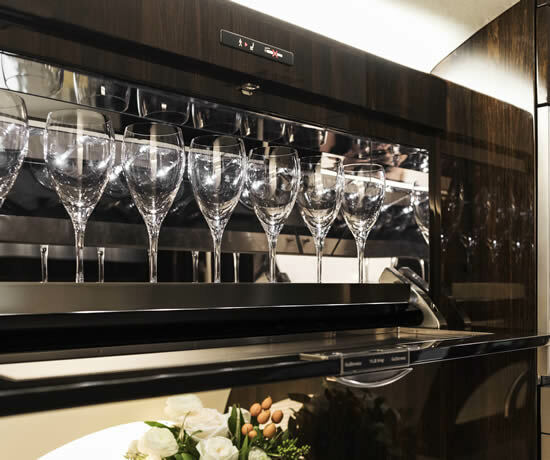 The new product has been developed by the MSB Design engineers for the Gulfstream G500 galley to provide a robust stowage system for valuable crystal and glassware, whilst at the same time providing an elegant, subtle new source of lighting. The holder will be on display at this year’s NBAA on the Gulfstream G500 at Henderson Executive Airport. The intelligently designed transparent galley racks are made of aerospace grade polycarbonate material, and plated components, which ensure valuable crystal and glassware is securely stowed. With the addition of the low voltage LED up-lighting, an elegant glow is emitted through the translucent units. MSB is producing first of a kind up-lit glass racks for aircraft galleys. MSB has designed the product specifically as a standard line-fit option on board Gulfstream G500 and G600 aircraft. Customizable variants will also be available, allowing owners to select their own preferred crystal shape option, or holder design. This is the first time MSB Design has provided any type of insert or glass rack with the additional lighting feature. MSB already works with Gulfstream to provide china and flatware inserts with options available on the Gulfstream G650, as well as the Gulfstream G500 and G600 family, by customer selection. The conference tables manufactured by MSB are also available on board Gulfstream G500 and G600 models.